With the one big exception of Rocky Mountain National Park, most of the Colorado Rockies are part of national forests and have no special status, though there are a few small areas protected as state parks. One popular location is Golden Gate Canyon State Park, 30 miles west of Denver, which contains a small area of wooded hills and valleys about 5 by 2 miles in extent, crossed by three roads and 11 named trails. Elevations are moderate, ranging from 10,400 to 7,700 feet, and almost all the land lies below the treeline; there are no dramatic rocky ridges or wide ranging vistas as in the national park 30 miles north. Nevertheless, Golden Gate Canyon is a popular hiking destination and it also offers camping, horse-riding, mountain biking and bird watching. Small meadows are home to many wildflowers in late spring and summer, and the area is good for winter sports during the snowy season, yet overall the state park is not that interesting, certainly when compared to the much more dramatic scenery of the nearby national park. The state park seems not to be very well signposted, and lies away from major travel routes. The main approach is along Hwy 119, a bendy road starting in the south at an intersection with US 6, 3 miles from I-70, then leading north to Nederland and on to Boulder. Hwy 46 (see map) forks eastwards and crosses the southern section of the state park before descending a canyon towards Golden, while the unpaved but good quality Gap Road branches off Hwy 119 three miles north, following close to the north edge of the park. These two side roads are connected by the short Mountain Base Road, which is paved but narrow, and not recommended for RVs or other large vehicles. Another route (Ralston Creek Road) branches off Hwy 46 and traverses the less visited eastern section of the park. The visitor center is along Hwy 46, the two campgrounds (both of which have electric hookups) are accessed via Gap Road, while trailheads and picnic spots are spread out along all roads. The highest point in the park is in the northwest, from where the land slopes down steadily towards the southeast, and most sections can be explored by trail. Gap Road leads through a small residential area to a self-service entrance station (fees $7 per vehicle in 2015) and a four-way junction - right is Mountain Base Road, descending 800 feet over 3.3 miles to Hwy 46, en route passing two trailheads, while left is a spur to Reverends Ridge Campground, situated on a wooded promontory with only limited views of the wider surroundings. 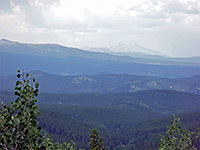 The main road continues a short distance to Panorama Point, an overlook at 9,300 feet from where distant, hazy mountains are visible to the north and west, through gaps in the trees - tallest is Longs Peak. 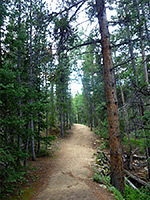 One of the 11 trails starts at the viewpoint - the 2.2 mile (loop) Raccoon Trail, rated moderate. 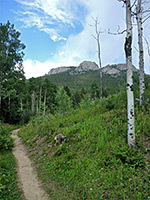 This descends 500 feet through the pine forest and follows a drainage into a more open valley, then returns via a mix of long grass meadows, airy aspen groves and small creeks, with some fleeting views of 10,540 foot Thorodin Mountain just north of the park, one of the few places where the granite bedrock is exposed. Back on the road, another trailhead is for the 7.4 mile Mule Deer Trail, which winds along the foot of two peaks then returns to the start via a path close to Mountain Base Road, loosing then gaining 880 feet. The road next passes the turning for Harmsen Ranch, a guest house, then for Aspen Meadow, site of the second of the two campgrounds - this is also wooded, but with open, dry meadowland close by. Two paths starting here are the Snowshoe Hare Trail (3 mile loop, fairly level), partly along two valleys and partly across wooded slopes, and the 1.2 mile Buffalo Trail, a connecting route that follows another drainage to Forgotten Valley, a location also reached from the south. Highway 46 is a wide, busy route which crosses 1.5 miles of the park's southwest corner. Along here are the south end of Mountain Base Road, Kriley Pond - popular for fishing and picnicking, and the visitor center, at the junction with Ralston Creek Road (Hwy 57) which gives access to the quieter eastern section of the park. Paths in the vicinity include the Beaver Trail (2.8 miles, partial loop), which climbs 1,050 feet up a wooded ridge to a 9,250 foot summit, the Black Bear Trail (3.4 miles), ascending equally steeply to the rocky peak of Ralston Roost and on to a junction with the Mule Deer Trail, and the 1.8 mile Horseshoe Trail which follows a valley into Frazer Meadow, and to another intersection with the Mule Deer Trail. The linked Ralston Creek Road heads east, across a private inholding, to more trailheads, picnic areas and parking places, some next to Ranch Ponds, a series of pools and marshy areas along the creek. This is the lowest elevation section of the park, and the hills are rather less wooded than those to the west so the trails (Mountain Lion and Burro, both long, intersecting loops), have generally better views, of the lowlands to the east.